Organizations have made significant investments in BI platforms like Cognos, augmenting them with governed and prepared data, business rules and security measures. But because the new self-service data visualization tools do not connect directly to these bastions of BI fortitude – and all their clean data – users bypass them altogether. 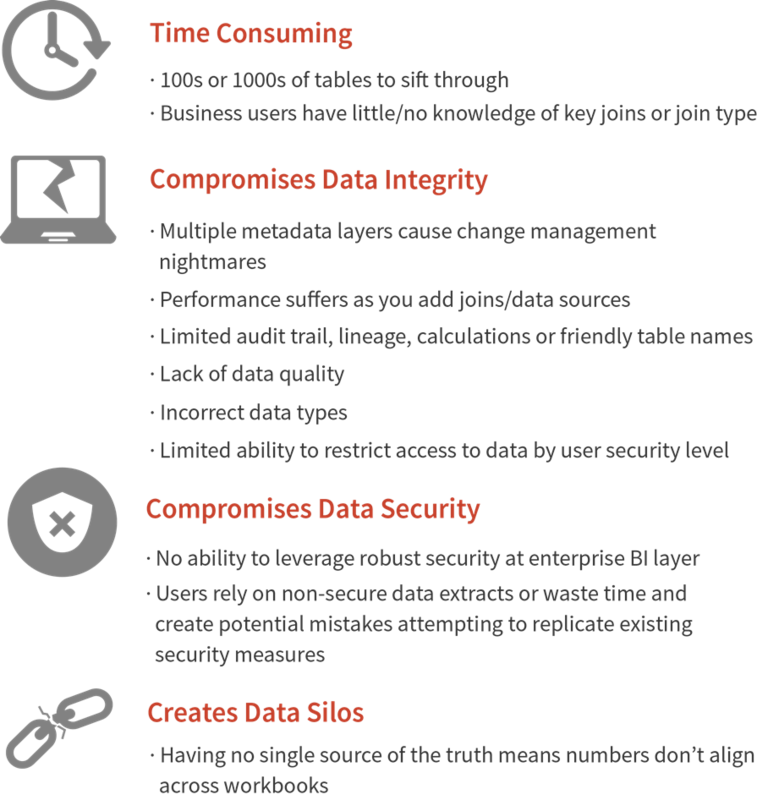 Instead, they spend 80% or more of their time remodeling the data and, in the process, potentially compromise data integrity and security. The Senturus Analytics Connector provides an easy solution to these issues, allowing visual data discovery tools to access the secure, prepared data in Cognos. The Senturus Analytics Connector allows Tableau and Power BI to tap directly into Cognos and TM1 as data sources. The straightforward UI allows users to then simply drag and drop data from Cognos into Tableau or Power BI. Data is obtained securely via an OBDC layer connection; user authentication and restriction controls remain in place. When your enterprise BI and visual analytics tools work in concert, beautiful things happen. Numbers match up. Performance improves. IT and business users both see huge time savings as manual, duplicative modeling efforts are eliminated. The Senturus Analytics Connector can be customized for use with other visual analytics tools such as Qlik and other enterprise BI platforms such as Microstrategy. Contact us to learn more. — Kimberly Griffin, Director for Electronic Research, Administration, Northwestern University. Two-week proof of concept including installation, configuration and testing.